Welcome to Stretch Beyond Stuck! Get yours below or click on the image! Want more Me-Time? Feeling less successful than you would like? for Busy Heart-Centered Women with No Time to Unwind. Do you feel exhausted? Wish you felt inspired and energized? Do you feel less than your most amazing self (but not sure why)? Do you doubt your intuition and inner wisdom? I totally know how you feel. I use to feel the same. Let me share my intuitive strategies with you. Get unstuck! Handle stress and recharge with my FREE DeStress-Manifest Kit. You will get 5 Strategies to unwind, recharge and connect with your inner light. Start living that bigger dream you have for yourself. FREE DeStress and Manifest Kit above! I combine coaching, modern & ancient strategies based in yoga, meditation and earth medicine for busy women like you to stretch beyond stuck and soften into your Authentic Amazing Self. You must dedicate time and energy to yourself and fill yourself up first in order to have energy to give to others. When you are feeling stuck - Set aside just 2 minutes a day for you! Take a few minutes to visit the Stretch Beyond Stuck blog and get your dose of relaxation and strategies for more balance and self-confidence. 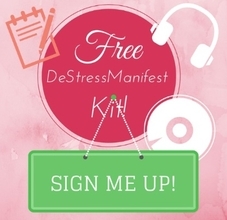 Don't forget to get your 5 Steps to DeStress-N-Manifest in the FREE Kit above! I combine coaching, modern & ancient teachings in yoga, meditation,relaxation and the wise woman way for busy women like you to stretch beyond stuck and soften into your Authentic Goddess Self.